You may have heard of the evolving “cashier-less” store trend or noticed the growth in discount retail stores. Is this the future of retail? How will we be shopping in 10 years? From 1990 to 2017, nail salons have seen a 247% increase in the retail industry while hardware stores, book stores and even shoe stores have seen double-digit decreases. Surprising? Hardly, because service retail stores such as hair/nail/wax, tattoo shops, and gyms can’t be easily replicated which is why they are increasing in towns. However, the increase in service retailers are not likely to provide more jobs to those actively seeking employment because there is a definite possibility these retailers will become automated. Large discount stores such as Dollar General are becoming more dominant in towns because they are replacing local stores including small bookshops. In fact, Dollar General is increasing their physical store count by 1,000 locations per year. Should we hit another recession as predicted, discount stores will thrive and continue growth. One way that discount stores can improve upon their competitive edge is by adding fresh produce to their product list. Dollar General has already recognized this opportunity and is including fresh produce items at their store locations. Walmart has become the leader of infusing tech into their retail experience and will continue by adding delivery as well as pick-up services for rural areas. Cashier-less and pop-up stores are manifesting in larger cities. In short, fancy retailers who are including all the bells and whistles through their in-store experiences will be limited to the metro areas due to the larger demographic. Contrary to belief, Millennials are becoming a building block for in-store sales versus online. According to a recent Deloitte study, high-income millennials were 24% less likely than other shoppers to shop in a store. However, low and middle-income millennials are behaving like consumers from every other generation. Although many believe that brick-and-mortar malls are disappearing from the retail world, it’s hopeful this is a new era for those retailers. The latest trends that are shaping brick and mortar include showroom stores, robotics, in-store experiences, and more. 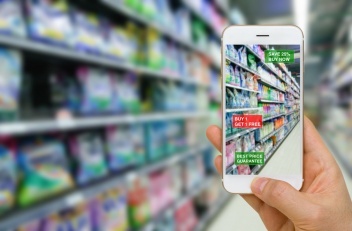 In fact, consumers are more likely to shop at a store where they can interact with products or where they can experience personalized interactions. Take Nike as an example; their latest location on Fifth Avenue in New York includes a customization bar where customers can interact with the latest products and customize them to their liking. Customers are embracing the journey they can create in physical stores. Supermarkets are becoming the retailers of the future. Pantry shopping trips have declined while online click and order shopping trends have increased. Look at Amazon Go for example; technology and physical store locations have joined together to create a better experience for consumers. What do future super markets look like? They are expected to have click and collect areas located next to pharmacy areas. The click and collect areas will be a simple station where customers can order in-store, online, or with the mobile app and pick-up their groceries in-store. There will be drive through areas for small orders and loading docks for large orders. In addition, they will have court-style dining areas for time-starved shoppers where they can shop for sales and promotions as they eat. Smaller strip-mall tenants will have walk through access to supermarkets as it is easy to navigate. Check-outs will become 80% self-checkout and 20% service checkout. Want to know more about the future of retail? Reach out to Verani Realty’s commercial division and we can connect you with an experienced Advisor who will answer any questions you may have about the evolving retail trends.